One of my recently discovered activities that I’m falling in love with is indoor rock climbing (though I suppose I may try outdoor rock climbing and bouldering one day, too). In a weird way, it’s the ultimate thinking person’s type of sport that is physically demanding, but also mentally challenging as well. Climbers like to talk in terminology like “problems”, “projects”, and “solutions” and it’s entirely accurate and applicable way to describe what climbing is all about. If you walk into a bouldering area in a gym, you will see climbers just sitting around, planning routes, thinking about how to position their bodies to make the right move and attacking routes over and over again. Difficult routes demand that you plan and think about how you can make your way up a vertical face while expending the least amount of energy. It’s odd, but I also think that it’s a very “romantic” (or “bromantic”?) activity because you’ll have the most fun climbing with someone else. There is a lot of communication and trust involved when one person is controlling the safety and well-being of another person suspended 40 feet in the air. For that same reason, it’s a great team building activity for companies because to climb, you need to be able to work together, communicate, and have trust in your partners. To get started, you can look up Google Maps and find some nearby rock climbing gyms and just call and take a class. I took my first class at Rockreation in Costa Mesa, CA where you had to schedule ahead and the classes are far more formalized, but there are also places like Rockville back home in NJ, where the classes are much more informal and you can just show up and take a short intro class. Basic safety including verbal commands and communications. What I hope that you can get from this is that there is a real art to this that is beautiful to watch in action. In that last video, the Bat Hang at 1:45 is a thing of beauty. Seasoned climbers make it look easy, but it really takes a lot of practice, experience, and creativity to move around like Cliff Simanski does in the video. Charlotte and Sandra working a wall. I’ve also learned that I’ve been wrecking my forearms because I’ve basically been muscling my way up the walls with my upper body strength alone. A strong grip and upper body are certainly beneficial for climbing, but you need far more than that to advance in the sport. In a sense, rock climbing has a lot in common with dance or gymnastics: it demands creative body movement, flexibility, balance, body awareness, and spatial awareness (maybe even more so because your life is on the line in some cases). 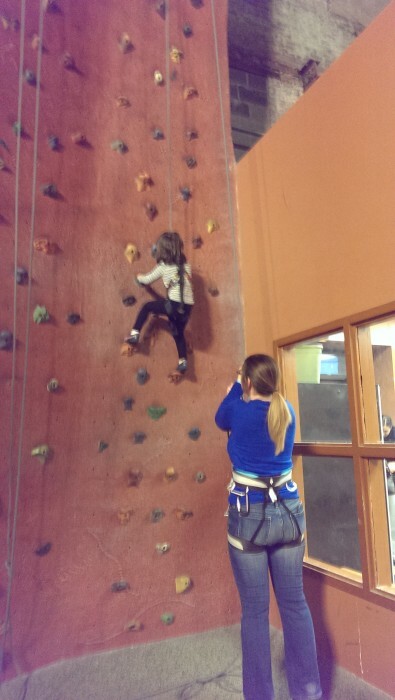 It’s a great activity for kids of all ages (Charlotte is 3.5 years old) to enjoy.